well.. it was a very unconventional burger dinner! when I was mixing in the peanutbutter, I was inspired to add some Indonesian flavors.. so I added ketjap and sambal to the meatmix. Cooked them on the griddle pan, served in a pita bread with slices of raw tomato, some caramalized leeks, and a side of sesame stir-fried paksoi. The meat was absolutely delicious, indeed very moist and juicy. Thanks for that recipe Marlene, I can see many interesting variations in the future! I ended up making meatloaf. 50% lamb shoulder and 50% beef (chuck). I started by running an onion and a few cloves of garlic through the meat grinder before tossing them in a warm skillet with a little butter over a low flame, while the garlic and onions were softening up I ground the meat. Next I dumped the ground meat, the cooked onions and garlic, along with a bunch of herbs from the herb garden, a couple fistfuls of panko, an egg, and some salt and pepper into a mixing bowl and mixed until it came together. I then set the pan back over high heat, shaped the meat into a loaf and set it in the pan on its side. After a couple of minutes I turned it onto the next side, once all four of the long sides were crispy I moved the meatloaf onto a sheet pan and stuck it in the oven at 375*F. 15 or 20 minutes into cooking (once it was nice and crispy on the outside) I spread some bbq sauce on it (tomato based bbq sauce, made earlier in the day). I left it in the oven until the probe thermometer said it was 160*F inside then transferred to a rack to rest for half an hour before eating. It’s been a long time since I’ve made meatloaf, but this turned out pretty well. I think for lunch I’ll reheat some of the meatloaf on the grill, make a sandwich, and toss together some creamed spinach to go with it. And what might be in beer burger? I've got ground beef in the fridge and was going to give the beanut butter burgers a shot tonight... but if there's a beer alternative, I'd love to know about it. Beer...beef...good. I did the PB burgers tonight - thanks for the recipe, Marlene! They really are very tender. It almost didn't need cheese (which is burger heresy!). You can definitely taste the peanut - I think some scallions or baby leeks and soy would hit the spot for condiments. Maybe ginger? I also like the ketjap idea, Chufi. I've got a spare patty for lunch later in the week so I can do some experimenting. I'm doing burgers this week. And, perhaps at The Cabin this weekend as well. Burgers are one of my favorite foods. No cheese. Lettuce, onion, mustard only. If I have some hot spicy ketcup, maybe a small dollop of that as well. The only other add on would be a slice of tomato, but the tomato must be worthy (they aren't right now in Minnesota). But, to meatloaf. 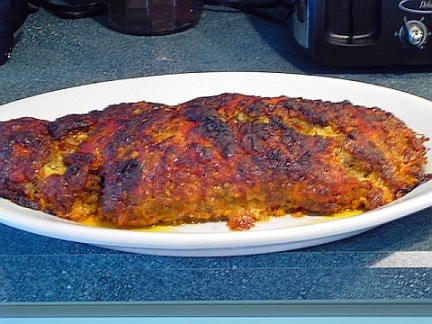 When I suggested to my family I might make meatloaf, the kids went "uugh. We hate meatloaf." 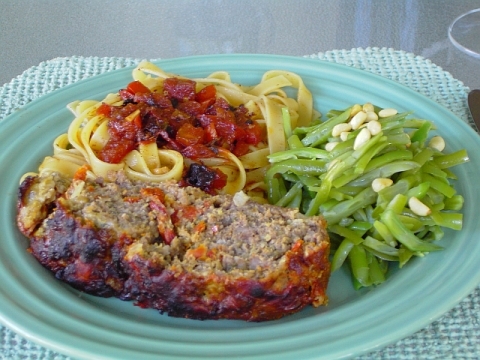 So, help me to tell my kids that meat loaf can be good. I'm thinking grilling, with some smoke, as Brooks has suggested, might be good. But, for some reason, every meatloaf I eat seems someone dry, whereas a burger doesn't. Meatballs aren't necessarily dry, either. We never cook burgers until there is no pink, but every meat loaf I have been served as been cooked through. Is part of the problem the mass? Or, is it the manner in which it is cooked? I am recalling the meatballs Marlene recented cooked during the Tag Team Blog, and some of them were simmered in wine. What about a meat log, browned, and simmered in wine. Further to this thought, I am thinking of the pearl balls I make. Pork "meat balls" with a really wet meat mixture, formed and rolled in sticky rice, and steamed. What about a steamed meat loaf? Perhaps browned under the broiler to give it a better appearance? One of the things that seems to be fairly traditional about meat loaf is that it uses some sort of starch as a binder, along with eggs. My pearl balls don't use either of these. Could this translate to a meat loaf? The beauty of the PB recipe is that almost any spice works very well with it. I put scallions in the last time I made them. They worked well. Ginger, most definately. And no, they don't really need cheese, but I like cheese on my burgers. So, how many families or couples are divided on the cheese thing on burgers? My family is not divided on that issue because I have stated most firmly that there will be no cheese on burgers in our house. Or they have to do everything I do! We are 100% cheese in this house. The only debate is among American, good sharp cheddar, or feta. So many cheeses, so little time . All cheeseboigers here: cheddar is the standard (we have a log of Tillamook we're making our way through thanks to Andrea's Montana family's visit in April), but I'm very partial to a blue (gorgonzola or stilton, if possible) burger. We are divided. Ryan and I yes, Don no cheese. 100% cheese here, too. Unless we're doing lamb burgers, then no cheese. Mmmm! Bleu cheese burger! Now I'm starting to want one. Snowangel Susan, I am about to post about a meatloaf that was definitely not dry. In the meantime, to cheese or not to cheese the burgers, we are both pretty much the same on that. Once in a while, if we are making a certain burger recipe such as black 'n' blue burgers or "Cheeseburgers in Paradise," we use it. However, for our usual and more frequently eaten hamburgers, NO. Too much talkie.. Not enough makie.. Lets see some photos here peoples.. Here at eG, your wish is our command. Even though I don't make meatloaf often, I've been wanting to try Armandino Batali's recipe since I first saw it in Bon Appétit. So what better time than during an eG Cook-Off? Perhaps a day with temperatures cooler than the 90's would have been a better time, but what the heck, the electric bill is going to be higher from the AC this month anyway... and it's all for a good cause! This is a monster meatloaf. Here's the recipe. When I do make meatloaf, I get into the comfort food thing and like to have mashed potatoes & gravy/sauce and corn with it. Change of plans last night... I went to the basket to get the potatoes, and we were out. It was one of those things where I couldn't believe my eyes. I just knew we had potatoes, but we didn't, and neither of us felt like going to the store. So we changed the menu to pasta, and I threw some pinenuts on French-style green beans to Italian it up a little. 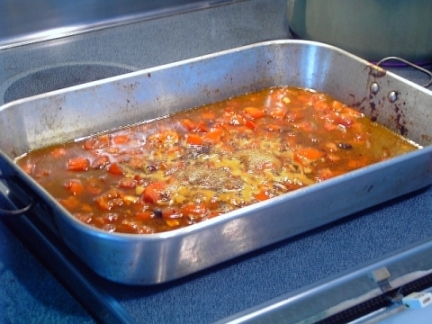 I deglazed the pan with red wine and then added chopped fresh tomatoes, garlic, and beef stock for a sauce. The sauce was good except that I didn't de-fat it enough, and it was too greasy. The leftover in the fridge will be good after I remove the layer from it. This seemed like a good time to drink jug wine, so we had Frontera Cab/Merlot. Overall, it was a very good dinner. I'm imagining burgers will show up at the House of Burgesses one night next week. For the curious, Beer Burgers. You can do these one of the two ways specified. Either way, both are moist, and delicious. What a neat idea. Thanks, Marlene. Susan delivers more often the US Postal System.. Gorgeous as always.. I wound up eating the leftover PB burger with swiss cheese and bacon topping. Yum - the salty smoky bacon & swiss went very nicely with the nutty burger. And thanks for posting the beer burger recipe! I'll have to try that next week. A little beer for the burger, a little for me. Burger... me. Despite a slightly pathetic plea, no one has posted any ideas about how to cook a meatloaf on the grill. The Spouse (AKA Grill Master of the Universe) is out of town so I will have to do this myself. So, if I heat the grill up, clean it, and then lower the heat until it approximates an oven temperature, that's good, right? I am resolved. Tomorrow, I will make meatloaf on the grill. I will! Has anyone ever grilled burgers made with ground lamb? I've seen a few recipes that topped lamb burgers with a tzaziki sauce (cucumbers and yogurt) that looked tempting. I've been tempted to try a few times but always got distracted by something else, plus I wonder about whether the lamb would need something else to keep it moist. I would be so tempted to mix the tzaziki sauce with the ground lamb for moistness, then grill. ...I am resolved. Tomorrow, I will make meatloaf on the grill. I will! I am impressed. I was not going to touch that. I have done that, and they were delicious. Plus it's fun to say lamb burgers instead of hamburgers. I can't remember the other ingredients in the burgers, but I do remember that they were moist. I'm sure it helped that we grill burgers only to medium rare or medium.